(for kindly authorization of the publishing house Volonté&Co-Rugginenti). Download here the article in Word (80K) or in pdf (52K). One of the primary requirements for the purpose of realising aesthetically and historically correct interpretations of the music of the past is to identify the music's original sound-medium. But it is not always possible to establish this precisely, above all as regards vocal compositions. For whereas we have available to us a comparatively wide range of period instruments whose particular characteristics can be objectively determined, in the case of song the sound produced cannot be separated from the actual performer. The human voice is extremely malleable, and varies in accordance with the anatomy, taste and technical equipment of the singer. There are also the effects of a multiplicity of cultural, social, anthropological and other factors which tend to change over time. This kind of variability can be experienced in listening to the earliest gramophone recordings: the voices of famous singers from the beginning of this century are generally thought not to correspond to the tastes of today. But if there is a large difference to be found after barely a hundred years, one is bound to ask oneself what sort of a surprise one would have in listening to music sung in a yet more remote past. Discordant positions have been taken in the debate among musicians and scholars concerning an historically appropriate style of vocal performance. Within the cultural ambit of Northern Europe, respected opinions on the topic call for a vocal production in which vibrato is slight, if not indeed entirely absent. This practice does facilitate extremely clean intonation; but while it reflects the musical customs of more northerly peoples, it is strikingly removed from the usual pattern in traditional Italian singing. In the light of the instructions cited, it may legitimately be supposed that Zacconi's 'tremolo' is neither a device of emphasis, to be used for expressive effect, nor indeed an ornament, like the trill or the mordent (5); rather, it presents itself as a constant attribute of the voice. The essential traits in terms of which Zacconi describes the 'tremolo' coincide almost entirely with those which characterise the vibrato of today. It is important, however, to distinguish the natural vibrato from the vocal effect which results in oscillations so wide (owing, usually, to efforts to increase the volume of the voice) as to impair intonation and sound-quality. Further confusion is caused by various artificial practices, such as the use of the diaphragm to 'move' the sound intentionally by means of small impulses, as in the technique employed by some players of wind instruments, or such as the more or less rapid contraction of the muscles of the larynx, a habit fairly widespread among singers of folk and pop music. These expedients do not add to the beauty of the voice or provide emphasis in the singing; one might conjecture that Zacconi is referring to something analogous when he speaks of the 'excessive and forced' tremolo which 'is tedious, and annoys'. (1) LUDOVICO ZACCONI, Prattica di Musica, Venice, Bartolomeo Carampello, 1596; anastatic reprint, Bologna, Forni, 1983. (2) Ib., Bk.I, folio 55, Ch.LXII. (3) Diminutions and improvised passages of agility. Since the art of 'passeggiare' (executing passaggios) constituted one of the essential elements in the training of singers from the 16th to the 19th century, the reader interested in this fundamentally important aspect of the performance of arias in this period will find it useful to consult the works cited in the present article, as well as in the general bibliography under 'riproduzioni in fac simile'. (4) Ib., Bk. I, f. 60, Ch. LXVI. (5) This is the view maintained by Thurston Dart in The Interpretation of Music, London, Hutchinson University Library, 1954, p. 50 of the 1967 edition, where he claims that the vocal vibrato is an effect like the trill or the mordent, and is to be employed as such; in the performance of ancient music therefore, according to the English musicologist, voices with vibrato would be entirely inappropriate in polyphony and solo singing alike. (6) Some remarks on the use of the breath in singing can also be found in: PIER FRANCESCO TOSI, Opinioni de' Cantori Antichi e Moderni, Bologna, Lelio dalla Volpe, 1723 - Repr. con note ed esempi di Luigi Leonesi, Naples, Di Gennaro & Morano, 1904; anast. repr. Bologna, Forni, 1985. 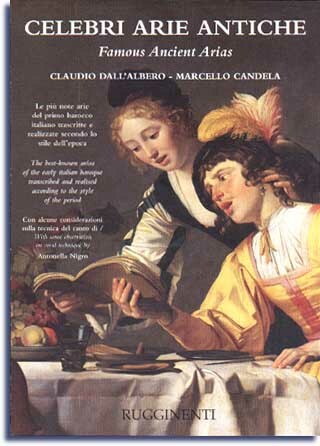 On p. 65 one reads: "Il Maestro può correggerne lo Scolaro con quegl'insegnamenti da cui si impara di far un buon uso del respiro, di provvedersene sempre più del bisogno, e di sfuggir gl'impegni se 'l petto non resiste. In ogni composizione gli faccia poi conoscere il sito di respirare, e di respirar senza fatica, poiché ci sono de'cantanti, che con affanno di chi sente penano come gli asmatici ripigliando stentatamente fiato ad ogni momento, o arrivando all'ultime note sfiatati morti." ("The maestro may correct the pupil by means of those instructions through which one learns to use the breath well, to provide oneself always with more than is needed, and to avoid demands with which the chest cannot cope. He should also enable him to recognise in any composition the points at which to draw breath without becoming tired, for there are singers who, to the distress of their audience, struggle like asthmatics, and laboriously catch their breath from one moment to the next or reach the last notes expiring from breathlessness"). Compare also the paragraph 'diminutions' in the authors' 'Notes on the Criteria of Realisation'. (7) GIOVANNI CAMILLO MAFFEI, Delle lettere del Signor G. C. M. da Solofra libri due: dove tra gli altri bellissimi pensieri di Filosofia e di Medicina v'è un discorso della voce e del modo d'apparar di garganta senza maestro, Naples, 1562; in Revue dee Musicologie, no. 38 (1956), p. 20.